Alper Seminar: Is A Captive Insurance Program Right For You? 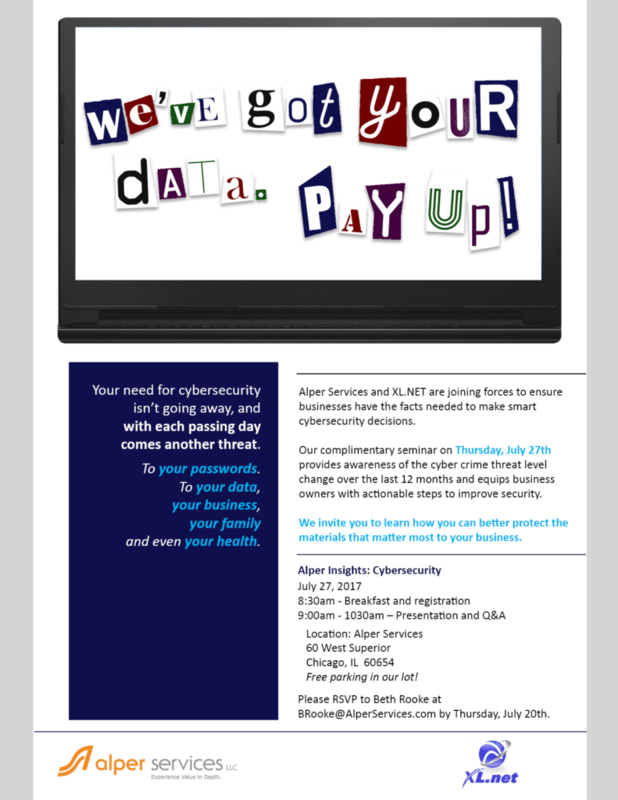 The Alper Captive Insurance Seminar has been postponed for a later date. However, you can read our latest Market Blueprint on Captives here. Transform your low claims history into increased profits. If your annual premiums are greater than your claims, a captive insurance program might be the ideal choice for your business. 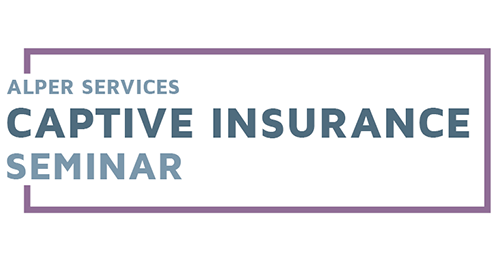 Learn about the advantages of a captive insurance program at our complimentary seminar on THURSDAY, APRIL 11th. We will review the benefits of captive programs both in their significant cost savings (up to 60% return of premiums + interest) and the control they provide you over general liability, auto and workers’ compensation coverages. Leading the discussion is Senior Vice President of Captive Resources, Mike McManus, who has worked closely with Alper Services to provide every advantage a captive insurance program can offer to our Clients. Are you a small employer or self-employed? Under a new rule your health care costs could decrease through an Association Health Plan. 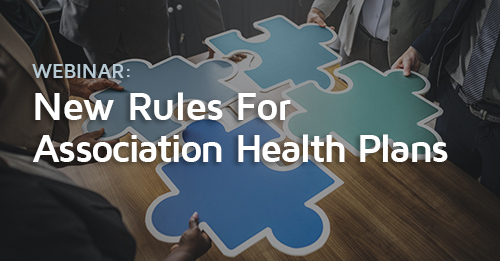 Association Health Plans (AHP) are arrangements that permit multiple employers to band together in order to purchase health coverage. Register for our upcoming webinar to find out more about the new rules and how you may be able to take advantage of them. Brian Donnelly, Health and Benefits Practice Leader for Alper Services will review the final regulations, discuss advantages and the potential pitfalls of AHP solutions and provide actionable steps that small employers and the self-employed can take to consider an Association Health Plan approach. It can be an administrative nightmare for employers to stay on top of current requirements under the Family Medical Leave Act (FMLA), in addition to changes in local sick leave laws. Join us on Thursday, May 17th at 9am for a complete overview of the FMLA’s specifications as well as how the new Cook County sick leave ordinance affects your business and employees. • Which employers are covered by FMLA and which employees are eligible? • What are the rules for the new tax credit under the new tax reform law? • What are the risks of not complying with the sick leave laws? • Does paid sick leave overlap with FMLA? • What are the employer/employee rights and responsibilities? Come prepared to ask our expert attorney speakers questions that relate to your specific business. Please RSVP to Brenda Cook at BCook@AlperServices.com or call 312-867-7312. It’s been almost seven years since the “reforms” in the Illinois Workers’ Comp Act. Yet when faced with ever-rising insurance premiums, pressures from societal changes, and mounting compliance questions, are Illinois employers really in a better place? Please join Brian Donnelly, Alper Services’ VP, Health and Benefits Practice Leader, and Ian Shea, CEO and Founder of I M Human, Inc., at a seminar to discuss why “Wellbeing” has replaced “Wellness” in the workplace. – Stand out amongst your competition in attracting new talent. Please RSVP to Beth Rooke at BRooke@AlperServices.com or 312-867-7307. A few weeks ago we saw how ransomware made companies WannaCry plus numerous attacks and hacks since, we’re likely to see more tears—and dollars— shed. These situations are not going away, and we need to counsel you – and empower you to counsel others who depend upon you – on the risks you face as well as what your current policies do and do not cover. On Thursday, July 27th Alper will host an Alper Insights seminar on Cybersecurity with Adam Radulovic of XL.net showcasing firsthand how susceptible your accounts are to a cyber breach. Is Your Workplace A Target? 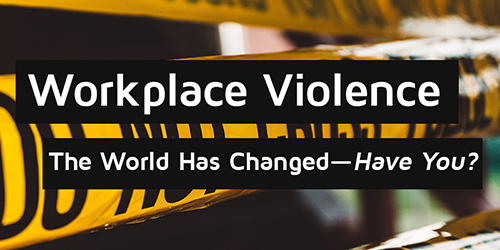 The U. S. Department of Justice reported over 1 million non-fatal workplace violence incidents in 2014. You may be thinking to yourself, “That would never happen in my company…” How do you know that? Could ANY of these 1 million violent episodes have been avoided? Alper Insights is bringing together three renowned experts who have had to answer this question. 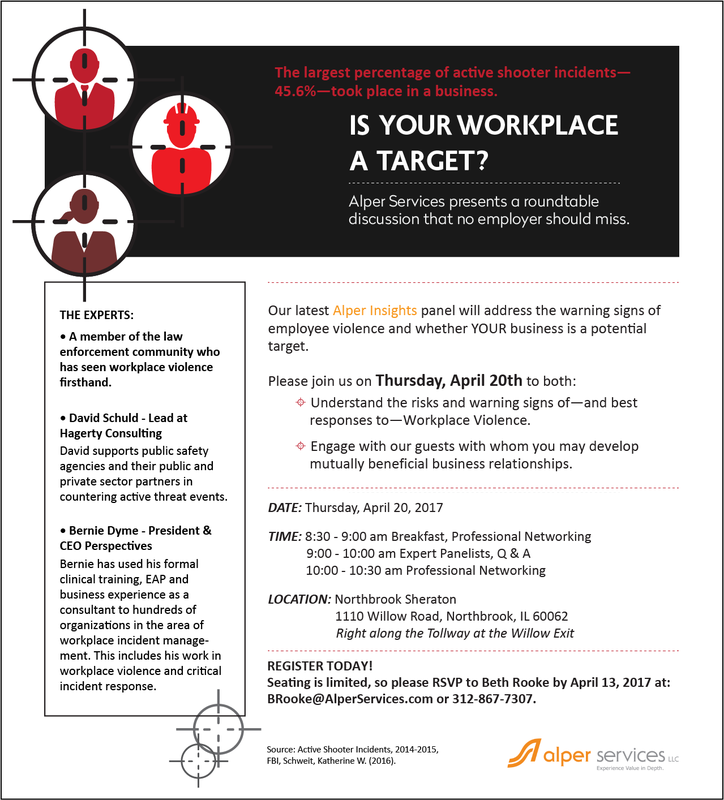 Please join us at this roundtable event to learn from our esteemed panel the warning signs to help proactively predict, prevent and develop the best responses to Workplace Violence. This is not your typical seminar. In addition to the educational portion of the morning, you will have the opportunity to engage with guests for the purpose of developing mutually beneficial business relationships. Come prepared to network and build your business! Seating is limited to please RSVP to Beth Rooke by April 13th, BRooke@AlperServices.com. With a handful of new OSHA laws in place and a new Administration coming in…what should we expect from OSHA? To sign up for this complimentary webinar, please follow this link. After registering, you will receive a confirmation email containing information about joining the webinar. For the eighth year we’re kicking off the holiday season with Chubb and Weinstein Meats to pack 50 Thanksgiving meals for deserving families through New Star and Lawrence Hall non-profits. 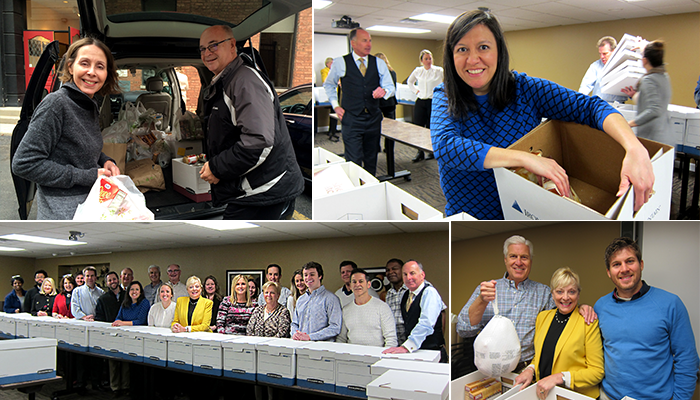 Our Thanksgiving boxes consisted of turkeys from Weinstein and favorite sides supplied by Chubb. We’re spreading the holiday love by partnering again with Weinstein to help them play Santa to the Austin neighborhood through their annual toy drive. Our donation will put smiles on the faces of 300 children at Leland Elementary School.